I'm trying to get organized after the Christmas madness but it just doesn't seem to be happening…so I'm going to post this card that I made a while ago and just never found the time to post. I made it for a little girls birthday and it was for some sketch challenge or other and now I can't even remember which one! The little birthday cake from Bring on the Cake is so cute on its own and a great image for a quick clean and simple card. I stamped the cake and cut it out with a Window framelit. I colored it in and then added some Dazzling Details which are hard to see. For a little girl who likes princesses I thought I should add some more bling with rhinestones. I used a scrap of Pretty in Pink DSP and a length of Rich Razzleberry stitched grosgrain ribbon. The button with a baker's twine bow is the final touch. I finally got back in the stamp room yesterday after almost 2 weeks and I hope to get some more new projects made to get back in a groove. Have a great (and safe) New Year's Eve tonight! I hope you all have a very Merry Christmas and have loved ones close by to celebrate with! I hope to be back blogging regularly at the end of the week after our families have headed home. Hopefully you have all of your cards finished and in the mail and don't need any more inspiration for this year but I thought I would share a card that I made 10 of last week. You can always 'Pin It' for next year (and hope that you remember to look back at it!). I needed some more cards to send out and saw a bunch of this style last year and thought it was so cute and now I finally got around to making one of my own. This design comes together quickly (if you pay attention and cut the cardstock right the first time or even the second time---third time's a charm!). The base is Early Espresso and the panels of the door are made from the Core'dinations Early Espresso cardstock. Once I embossed them with the Woodgrain embossing folder and sanded them a bit they really began to look like a weathered front door. The wreath is made by stamping the Blue Ribbon stamp in Gumball Green onto Gumball Green Core'dinations cardstock and using the matching punches to cut out first the center circle and then the scalloped circle. The bow is 1/8" taffeta Real Red ribbon and is adhered to the wreath with a glue dot. The door knob is just a Gold Glimmer brad. I am so proud of myself. I just mailed out 78 hand stamped Christmas cards! Wow! I need to make about 15 more to go along with gifts that will be hand delivered but man I am glad to have that item checked off my "to-do" list. If I end of having some time I might send out a few more but for now the bulk mailing is complete! I whipped this one up the other night after seeing some advertisement on Splitcoaststampers that had a similar idea. I'm sure there are lots of examples of this out there and it gave me a great feeling to use up some bits of scraps. I used the Fab Friday color challenge again since it's such a great combo for Christmas. The colors used are Real Red, Primrose Pink, Gumball Green, Pool Party and Whisper White. There's still time to make your card and play along with us. This challenge is open until Dec. 20! It's hard to see but the white panel is embossed with the Perfect Polka Dots embossing folder…goes with all the dots on the DSPs! See that awesome giant rhinestone at the top of the tree?? Well that's a sneak peek of a new items that will be in the upcoming Spring catalog. Larger rhinestones! Sweet! It works perfectly as the star on top don't you think? Here's another project that my ladies made at my Tags, Bags & Boxes class. It's a super sweet snowman tag. The fun part about this tag is the pom pom made from the awesome sweater trim! I think some of my ladies didn't like the pom pom but with a little patience they come out adorable! I need to make some more this weekend….I have some trim left that probably won't look very good on spring cards! We used a tag made from the 2 Tags die and Crumb Cake cardstock. Then it was embossed with the Northern Flurry embossing folder. The snowman from Snow Much Fun was stamped, colored in and bit of Dazzling Details added to his edges that you can't see in the photo. He is punched out and mounted on a Garden Green scalloped circle. The pom pom is really easy….along the same lines as a fork bow. Just wrap the sweater trim around the tines of a serving fork about 15-20 times. Then take another length of trim and thread it between the center tine at the top and the bottom so it goes around the trim you wound around the fork. Tie it really tight in a knot and then slide the trim off of the fork. You'll have loops on both sides of the knot, just use sharp scissors to cut the loops. Then fluff and shape the pom pom. You'll get some shedding (I thought it looked like something bad had happened to a muppet in my stamp room!) and you'll probably have some longer strands, just trim those down with scissors. Ta-da!! A pom pom! So much to do, so little time! Have a great day! Here is one of the other projects my stamping ladies did at my last class in November. It's a plain kraft gift bag that you can get at most craft stores and we jazzed it up. They are super easy to decorate to fit any theme that you need. We stamped the bag with Illuminate ink and the Snowflake Soiree set. The tissue paper was also stamped with Pool Party and Lucky Limeaid ink to match the flags. The flags are attached with sticky strip at the very top. Love that shimmer from the Illuminate ink. At some angles it disappears and then BAM! The snowflakes show up! The 2 snowflakes were cut with Silver Glimmer paper and the Snow Flurry die. A red Glimmer brad holds them together and to the bag. Just use a paper piercer to poke a hole through the bag and stick the brad through. It's hard to see in this photo but the smaller snowflake was sponged with Pool Party ink and then heat set. Glimmer Paper is already really cool just the way it comes but being able to change the color makes it even better! Here's a close up of the tissue paper and the tag. The tag was cut with the Labels framelits, stamped with a Pool Party snowflake and then the sentiment is stamped in black right over the top of the snowflake. It is attached to the bag handle with a bit of Real Red 1/8" taffeta ribbon. Where have the last 2 weeks gone? I feel like it was just Thanksgiving and now we're well on our way to Christmas. Are you decorated? Shopping finished? Cookies baked? Probably not on that last one huh? You don't want them to be stale before Christmas is here! I've got some more decorating and some shopping to do but all the big stuff is finished….big tree inside and lights outside in the yard. Now I just have to find a decent fake tree for our front entrance hall. I had a tree that just wasn't cutting it anymore and after it did its duty last year we tossed it. I might just get another real one (like we have in the family room but much smaller to my husbands relief) and wait until the after Christmas sales to get an artificial one. What a Christmas dilemma huh? Lol! Well since it's Friday we have another awesome challenge over at Fab Friday. Mindy has given us some fantastic colors to work with! Look at these beauties! Primrose Petals, Real Red, Pool Party, Gumball Green and Whisper White. I'm really excited to see what people come up with. I think this combo would be great for Christmas and also for every day cards! I went with a Christmas card since I am still woefully short on cards to mail out. I think I may make several more of this design since I like it so much. My photo doesn't do it justice I don't think. I just couldn't get a good photo to save my life. Squint your eyes up a bit and use your imagination! Maybe it was the white background or something….who knows. Maybe I should ask for a photography class for Christmas. I had some of the retired long skinny envelopes sitting around and I wanted to get them used up to make some more room since I have a (large) box of Spring catalog pre-order and Sale-a-Bration goodies coming. So long and narrow it is. When I received the ornament framelits at the end of the summer I immediately thought this short fat shape looked just like a Christmas light bulb and have been meaning to try it out ever since. I cut the "bulbs" using a few of challenge colors using the framelits. I sponged some silver Shimmer Paint on the base with a sponge dauber. While my lightbulbs were drying I cut a Pool Party base and a layer of Primrose Petals and Whisper White. The Whisper White layer was run through the Big Shot with the Northern Flurry embossing folder. Then it was time for stringing the lights….everyone's favorite Christmas activity right? I used Pool Party baker's twine and wrapped a loop around the bulb base. I put a glue dot on the back to hold the twine in place and then worked my way down the line alternating colors. I stamped the sentiment from Sweet Essentials in black and then adhered my lights across the Whisper White panel. I tucked the ends of the twine behind and then adhered all the layers to the card base. Not a lot of stamping but I like it. Hop over the the Fab Friday blog to see the other design team creations and then play along. I'd love to see what you create with these colors! Here's a cute tag that my stamping ladies made at last week's class. We started with a Crumb Cake tag cut from the Two Tags die. The holly branch from Watercolor Winter was stamped in Garden Green and then the berries filled in with the Cherry Cobbler Dazzling Details. The Very Vanilla flag was also stamped in Garden Green with the "Merry Christmas" from More Merry Messages. The bow was tied with Cherry Cobbler tulle ribbon and accented with an Antique Brad. Instead of trying to shove the brad through the tulle we just folded over the prongs and used a hot glue gun to adhere the brad to the bow. Super easy! Just make sure you get your bow just right before gluing the brad! I usually don't get my act together enough to make hand stamped gift tags but this one was so easy I might try to make enough for at least the teacher gifts this year. They all work so hard that they certainly deserve some special packaging for their gifts. Where are the days going?? I just realized that I haven't posted a project since last Tuesday! Yikes! I have things to show you but it's just a matter of taking the photos and getting them ready to post. Hopefully I can find time to do all that this week….among about 20 other things on my "to-do" list! I made this card to send to a new demo who recently joined my team. Jen is an old stamping buddy from Richmond who moved to Boston and couldn't resist the great deal of the Starter Kit and the free ink pad set (only good until Dec. 16), not to mention the discount! If you're looking for a Stampin' Up! demonstrator in the Boston area just let me know and I'll get you hooked up with Jen! I used the current Fab Friday sketch because that large center panel just has so many possibilities. I haven't used the Moving Forward set too much since I got it but I think it has great images. I got a little fussy with this one and used the Stamp-a-ma-jig to get the trike just right. First, I colored the trike with Calypso Coral and Basic Black markers. I omitted the basket and the spokes on the wheels. Then I went back and colored the basket and spokes with my (retired) Versamarker. I lined everything back up with the Stamp-a-ma-jig and then heat embossed with silver embossing powder. It looks neat in real life since the metallic parts of the bike are raised and shiny. I added some punched flowers and silver brads to complete the scene. The banner was handcut and underneath the 1/8" black taffeta bow is a bitty button that's hard to see. The little strip of DSP is a section that I cut from one of the Patio Party DSP patterns. I've got to go start checking things off my list on this busy Monday morning! I'm actually ahead of schedule getting ready for my class tonight so I thought I would quickly get this card posted. I have hardly used Watercolor Winter yet but after seeing some cool samples around blog land I thought my set should see some ink before Christmas was over! The base is Sahara Sand and I stamped the pine branches all around in Garden Green. I then sponged around the edges with Sahara Sand. The image panel is Very Vanilla and I stamped the Christmas greeting from Delightful Dozen in Early Espresso. For the pine branches I stamped off one time for each branch making the Garden Green a bit lighter for this panel. I stamped off once as well for the pinecones using Early Espresso ink. That gave me a lighter image to pair with the pinecone outline stamp which I stamped in Early Espresso at full strength right over the top of the original pinecones. The image panel is layered over another Sahara Sand panel that was embossed with the Houndstooth embossing folder and sponged. This is backed by a panel of Garden Green. I finished this card off with 2 metallic brads on the left side and popped it up with dimensionals. Reminder! Tomorrow is the last day for the Online Extravaganza! Have you gotten everything that you want? Don't miss out on the super savings! Check out my online store to start shopping! For my local ladies; I'll be placing one last group order tomorrow morning so if you're not coming to class tonight but would still like to put in an order please e-mail it to me by tomorrow (Wed.) morning at 9am. Last week I stumbled upon a new challenge blog dedicated to digital scrapbooking with My Digital Studio. It's called MDS Monday and this week they are starting us off with a sketch challenge. As I've been creating pages for my 2012 photo book I've found I need some inspiration to get started just like I do with cards sometimes. I'm glad I found this challenge and will be looking forward to the next one! I thought this was a cute picture of Alex and I to use for this sketch. It was fun playing with some new downloads that I got a few weeks ago. Remember that the Online Extravaganza ends this Wednesday! And if you're interested in My Digital Studio to start creating your own projects it is on sale for 50% off but only until Wednesday. Check out my online store to get begin shopping or to download a trial version of My Digital Studio. I hope everyone had a great Thanksgiving and enjoyed the time with family and friends. As usual my father-in-law spoiled us rotten with his awesome cooking. We were lucky enough to snag some leftovers to bring home so I'm looking forward to Thanksgiving dinner take 2 tonight! There's even some of the dessert we made left! Bonus! I'm late getting this posted but here's my project for Fab Friday 07! It's a really fun sketch that Mindy has for this time around. Check out the rest of the Design Team projects! They are super talented! This was a fun sketch since the main panel is so big you can do just about anything you'd like. I wanted to use the great image from the retired set Tidings of Joy that didn't see nearly enough ink last year. It's a bit time consuming to watercolor but it's so adorable! I mixed the image with a sentiment from More Merry Messages. I added a bit of shimmer throughout this card...I painted Champagne Shimmer paint on Baby Jesus' blanket and the star. To highlight the sentiment a bit I lightly colored over the scroll-y words with an even lighter coat of Champagne Shimmer paint and then added a little banner made from Champagne Glimmer paper. You'd think with all this champagne flowing on here that it would be New Year's eve or something! Here are some close ups of the details! Don't forget to see the other team members projects over at Fab Friday. And get to work on your own submission! We'd love to have you play along! Is everyone prepared for Thanksgiving tomorrow? We're in pretty good shape minus the cold that I've come down with. I have all the ingredients needed to make the 2 desserts I volunteered to bring. Just need to bake those up tonight. I'm laying low today, drinking a lot of OJ, having tea with honey and lemon and trying to fight this cold. Anyone have any home remedies they swear by? I've been stamping quite a bit lately to get ready for my class next and I'll share those project after my ladies get first peek at them. I also have several other cards but they are stuck on the camera and I'm thinking I don't have the energy to download and edit them right now. I know pretty pathetic huh? Maybe I'll get a burst of energy later! Anyway here's a card a made several weeks ago for a birthday party Ryan was invited to. While I had plenty of lead time to make the card I didn't get to it until the morning of the party so I didn't have a lot of time to get futzy over it. I chose my colors from the Color Coach (love that thing!) and used one of the Fab Friday challenge sketches. I think I used this great sketch for about 6 cards! The base is Midnight Muse stamped with the shooting star stamp from Blast Off also in Midnight Muse. To make the banner I used the Chevron e.f. on a strip of Gumball Green Bore'dinations cardstock and then lightly sanded it down. I cut 2 stars out with the retired Stars Big Shot die, one in WHisper White and the other in Marina Mist. The finishing touch is a popped up 7 die cut from silver Glimmer paper. Super simple but I try to remember my audience for kids cards! Have a wonderful Thanksgiving! Thanks for looking! Did you stamp today? Promotions! News! Sales! Oh My! First up is the Online Extravaganza! Wow! So many great deals and one day door busters that you don't want to miss out! Head to my online store Nov. 19-28 to take advantage of these deals. Local customers can e-mail me their orders if they prefer. The Big Shot is on sale for Monday only! If you're thinking of joining the Stampin' Up! family now is a perfect time...Online Extravaganza items can be included in your starter kit!! Wow again! More bang for the $99 starter kit (you get up to $125 worth of items and free shipping!). Check out the other bonus if you join now at the bottom of this post! Check out the whole list of sale items HERE!! Next is the limited time promotion of the Sizzix Texture Boutique Embossing Machine. This seems like a great little tool for embossing with the embossing folders. How cute is that purse shape? These are limited in number and seem to be selling fast. If you have questions if this tool would be good for your crafting style don't hesitate to ask me! Cool new smartphone product! Talking Tags! And to add Stampin' Up! to your iPhone (android version coming soon!) the Simply Sent App!! 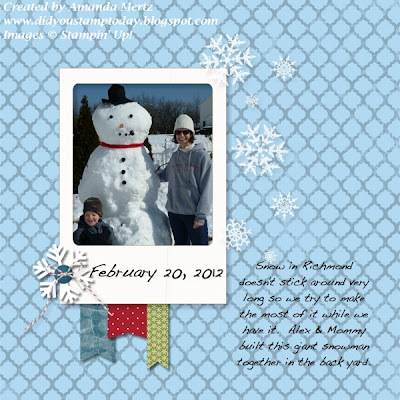 Send personalized e-cards with a Stampin' Up! flair with this Free app! Add your own photos and greetings and share it with everyone! Download it from iTunes or the App Store, share it with all your friends, and post a review! And last but not least!! Free Ink Pad Promotion!! Until Dec. 16! Hostesses who hold a minimum $450 party during the promotion period will receive a FREE collection of Classic Stampin Pads--they can choose from Brights, Subtles, or Regals--a $49.95 value! Plus, the free ink is in addition to the regular hostess benefits--INK-redible! New demonstrators who join the Stampin' Up! family during the promotion period will received a FREE collection of Classic Stampin Pads (a $49.95 value)--they can choose from Brights, Subtles, or Regals! It's INK-redible! If you've stuck with me this far here is your reward! =) I didn't say it was going to be an awesome reward but it's better than nothing! At some point over the last year I began to think how fun it would be to have a photo book of our 2012 memories. Trips we'd been on, places we'd visited, goofy every day stuff that happens at our house, you know that kind of photo book. We tend to take a lot of photos and they sit on our computer and our screen saver scrolls through them but we really don't do anything else with them. Sometimes Alex will sit at the computer for 15 or 20 minutes watching the random selections appear. He thinks it's funny to try to guess if the baby is Ryan or himself. Wouldn't it be nice to sit down and flip through a book of your whole year? Exactly! I've had My Digital Studio (MDS) for a while now but just never sat down to start making anything. Then Stampin' Up! came out with My Digital Studio 2....well that just might have been the incentive that I needed to get in gear. I upgraded, downloaded a bunch of new papers, embellishments and kits and decided that I was going to start with January of 2012 and pick some photos and get them on a page. I know I've got a long way to go but I think if I keep working through this year and try to do 2013 one month at a time I'll eventually get there! This is my first page. It took a while; I'm not a natural scrapbooker by any means so I needed to fiddle a bit and refresh my memory about MDS and learn the new features. I think it came out OK and hope that I become more proficient with practice. Mydigitalstudio.net is a great resource and I know I will be spending a lot more time there as I work my way through 2012. You can download a trial version of My Digital Studio if you're interested in seeing how it all works. Head to my Stampin' Up! site to learn how you can get started on your own 2012 Photo Book (or cards, or single pages or whatever you can dream up!). Once in a while I get to combine my stamping obsession with my everyday, ordinary duties as an at home mom. At the end of the summer I volunteered to co-chair our preschool parent booster club. We recently finished up our largest money making event of the year with a Holiday Stop & Shop and used book sale. We had some great parent volunteers to pull it off so of course I had to make some thank you cards for those who showed up when they said they would and got the job done. I'm a big believer in thank you cards....we all have people we need to thank for big and small things so don't wait....get that card stamped and in the mail! I needed to make about 20 cards so I wanted one that wasn't too time consuming. 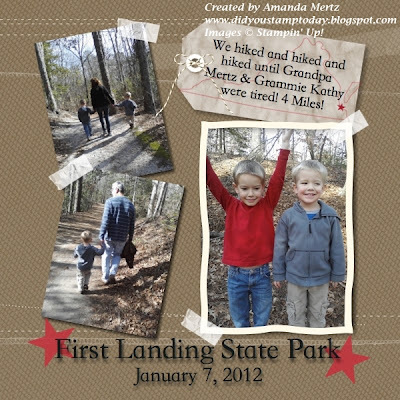 I browsed the gallery over at Splitcoaststampers and saw this card by sf9erfan. I loved that it used the sentiment as the main stamped image. My card base is Crumb Cake and then I layered Rich Razzleberry with one of the bold patterns from the Floral District DSP. I rounded the corners of those panels to soften the look a bit. I stamped the Seasonal Sayings thanks stamp which I got as a single stamp purchase as I didn't need the whole set at this time. Great way to boost your sentiment choices without buying a whole set! Next I made a fork bow out of retired Rich Razzleberry ribbon and wrapped it around the DSP panel above the sentiment. The little flowers are from Betsy's Blossoms set and are stamped with Daffodil Delight and Rich Razzleberry ink and punched out. I popped the large flower up on a dimensional and added a rhinestone to it and one of the small flowers. I've heard from a few parents that they really appreciated the cards so I know gestures of thanks are appreciated no matter how small! Can you believe we are on our 6th Fab Friday challenge already? The time has just flown by and I'm having a blast with Mindy's challenges. Today she has a color challenge for us. I have to admit that this challenge snuck up on me...I think I've been thrown off my schedule since the storm last week and then election day on Tuesday. It seems that every time I turn around the boys are having a day off from school. I finally put all the boring household "to-do" items aside this morning and worked on this card. I had the idea in my head I just had to make it work with the actual paper...sometime easier said then done! Head over to the Fab Friday challenge to see the other awesome designer creations. These colors are so great for masculine themed cards or for fall cards as well. I decided to go with a thank you card. Change up the sentiment and you've got a birthday card! I used the Postage Due set and stamped the large background stamp in Crumb Cake onto a Crumb Cake base stamping several times without re-inking to fill up the whole card front. I used a strip of scrap First Edition Specialty DSP which I dirtied up with some sponging with Crumb Cake. I wrapped some linen thread around the card front and tied it off with a small length of Midnight Muse stitched ribbon. For the stamps I used each of the 3 stamp stamps (ha!) using the same color ink and paper. The postage stamp punch makes quick work of a layout like this. For the sentiment I stamped the "thanks" from Petite Pairs in Midnight Muse onto Very Vanilla and punched that one out as well. I sponged a bit of Crumb Cake onto the edges and added a Vintage Trinket brad to the corner. Each stamp is popped with a dimensional. Let's see what you can come up with using this fabulous color combination! Ahhhhhh....it's finally here! Election day! Regardless of which way you're voting today I know we can all agree that not having the constant political phone calls will be awesome! I don't think I've answered my phone for more than a month! At one point we had 15 messages on the answering machine and that didn't even count the calls that hung up before the machine picked up. The trials and tribulations of living in a swing state I guess. And another thing....I understand the need to use schools for voting precincts but really....bringing a 6 year old and 4 year old to stand in line to vote is quite tiresome. I think I will need a few more cups of coffee before tackling that part of my day. On a more serious note; don't take the privilege of voting lightly. Many people have lost their lives in our country's history to give us this ability to choose our leaders. Let us not take those sacrifices for granted. The Public Service Announcement is over....now onto the card! We went to a family wedding a few weeks ago and this is the card that I made for the special occasion. I was short on time that week (when am I ever long on time right?) so I quickly browsed through the gallery over at Splitcoaststampers for some inspiration. I came across this card by SanFransister. Gorgeous! If you haven't joined Splitcoaststampers (SCS) I highly recommend it. There are so many great resources one of which is the fantastic gallery. Go check it out! For my card I made a larger size than I normally do. This one measures around 5 x 7. I had a few random envelopes left from another project and wanted to size the card to match. As you can see I really just CASEd (Copy and Share Everything) SanFransister's card. I didn't have the exact supplies she used so I substituted what I had on hand. The base is Sahara Sand with the right side corners rounded which I carried through to the other layers. Next is a layer of Very Vanilla. I stamped the "Congratulations" in Sahara Sand ink and added the sprinkling of rhinestones. I used more rhinestones than the inspiration card as my card was larger and needed more to balance the size. Next I added a fork bow made from the retired Very Vanilla satin ribbon. I kind of miss this ribbon as it is so elegant. The top layer is again Sahara Sand and is embossed with the Vintage Wallpaper embossing folder. This is going to be a super fast post today. We've got lots of places to be today! If you're in the Richmond area come on over to the Epiphany Lutheran Holiday Stop & Shop from 9-5 today. There are tons of great vendors selling everything from paintings to jewelry to clay pieces. I'll be working at the used book sale to benefit the preschool so stop on by and say hi and get some of your Christmas shopping done early! The sale is at Epiphany Lutheran Church at 1400 Horsepen Rd. Richmond 23226. I wanted to make a card last week to send out to one of my stamping ladies who made me the cutest little wool acorns. They are so adorable I can't stop looking at them! I love the colors too, so rich. Thanks Andrea! I love them. I used the very versatile sketch from the current Fab Friday challenge. I think I've made about 6 different cards with this sketch! Head over there to see the other designers inspiration and play along! You can't really see it in the photo but the maple leaf was embossed with the Woodgrain e.f. before using the spritzer tool on it. I needed some cards to send out to a few of my stamping ladies so I used the cool sketch over at The Paper Players to get my mojo going. I was bound and determined to keep using the Howlstooth & Scarringbone DSP even though Halloween was over yesterday. The base is Marina Mist with a layer of Very Vanilla that was embossed with the Perfect Polka Dots e.f. Next I pulled in some of my Howlstooth & Scarringbone DSP edged with strips of Early Espresso. I made the banner from Marina Mist cardstock and then embossed some lines using the Simply Scored. I stamped the cage and bird from Aviary and then cut them out with the Windows Framelit. I added a little loop of Early Espresso stitched grosgrain. Then I stamped a quick "hello" from the Pennant Parade set and punch it out with the jewelry tag punch. I held the tag and ribbon loop in place with a Marina Mist brad. Accessories: Windows Framelits, stitched grosgrain, brad, dimensionals, jewelry tag punch, Simply Scored, Perfect Polka Dot e.f. The "5" Car Sponsored by Stampin' Up! Oh my! The Halloween nonsense is over for another year! We had a great time last night. We had a bunch of the neighbors over for pizza and then headed out to trick-or-treat. Well Matt took the boys around the neighborhood and I sat on my porch with a glass of wine and handed out candy with some of the other moms. Maybe I'll get more customers?!? Alex was a karate guy. HI-YA! HI-YA! My mother-in-law had sent down an old karate outfit from when DH & his brother did karate way back in the day. The pants were way too large for Alex but the shirt was like a dress anyway so it didn't matter about the pants. Check out that karate chop he's doing! Do they look crazed for candy or what? I'll be back later tonight or tomorrow with a card! Thanks for letting me share my family! Sympathy cards are always so hard to make. I never really know where to start so when I had to make a sympathy card over the weekend I let 2 challenges do the work for me. I never want to do "over the top" cards but I also don't want to just slap something together. Getting the right balance is the key. I hope our friends can feel the love and prayers we sent to them. I used the current sketch at Fab Friday as well as this weeks challenge at CAS-ual Fridays which is to use Kraft or as we call it now at Stampin' Up!, Crumb Cake. I used the Festival of Print paper stack for my banner and wrapped a Very Vanilla seam binding bow around it. For the image panel I cut out a Windows Framelit and before popping it out of the die I sponged it with Crumb Cake ink which left a nice little border around the edge. I also inked up Serene Silhouettes in Chocolate Chip ink and stamped it right over the sponging. Then I popped the cardstock out of the die and wiped the excess ink off of it with a tissue. Next I added the sympathy sentiment from Petite Pairs and a few pearls to the flowers. Off to finish up preparing for having the neighbors come over for pizza before heading out to trick or treat! Hope you have a fantastic Halloween! Another wet cold day here in Richmond and another day of schools being closed! I hope all our friends and family to the north are safe and sound. The photos of New York City and New Jersey are crazy. I hope everyone got some place safe before all that water started pouring in! I even heard that in Maryland they had some snow! My thoughts and prayers are with all those affected by the storm. And now for something weather related that isn't dangerous! A snowflake card! This is the last of the cards we made last week at my stamp-a-stack. As I told my ladies, I just can't resist the blue and silver snowflake cards. Every year I have to design at least one. I think it's just a classic pretty combination. This year we used the new Snowflake Soiree set along with lots of shimmer! The snowflakes on the Not Quite Navy layer are stamped with the new Illuminate ink pad. They are just gorgeous! The Glimmer paper snowflakes were cut out with the Snow Flurry Bigz die and layered with a glue dot. We used a length of organdy ribbon across the top of the NQN panel. The "Believe" is stamped in Not Quite Navy ink. And lastly we sprayed the whole card with shimmer mist. This is a sparkly card for sure! So if you've got Did You Stamp Today? on a reader you're probably sick of me already this morning. Stampin' Up! is keeping us demos on our toes today with all these great digital freebies and 15% off stamp sale today! For more details see my previous posts from this morning. Not only do I have a lot going on stamping-wise but it's a busy, loud morning here at home. We've had schools canceled due to Hurricane Sandy. It's hardly windy at all here, just some gusts now and then and it hasn't rained much at all so the day off from school seems a bit silly. I know that it will probably get worse later on and they are just being cautious but it's looking to be a long day inside for us! We've already burned through paint pens and glitter glue, kids stamping, and Play Doh! And it's not even 11am! My poor abused kitchen table is begging for a break! I have some cards to share that my stamping ladies made last week at my stamp-a-stack. They made 2 of each design. This design is really quick to put together. We've used a Crumb Cake base with a layer of either Gumball Green or Cherry Cobbler Core'dinations cardstock. The Core'dinations cardstock is embossed with the Holiday Frame folder and lightly sanded to bring out more of the details. The ornaments were stamped in opposite colors from embossed panel and cut out with the matching framelits and popped up with a dimensional. We stamped a Cherry Cobbler and Gumball Green ornament on the same piece of cardstock and ran both framelit shapes through the Big Shot at the same time; no need to do each one separately. It really makes these cards quick! We added a rhinestone to the center of the ornament and a Very Vanilla seam binding fork bow to the top. You can't get much easier than that! And remember that the Ornament Keepsakes bundle with the added Candlelight Christmas Specialty DSP will get you the Festive Piercing pack for free ($7.95 value!). You could make a ton of Christmas cards and projects with these supplies! Don't wait though this deal is only good through the end October. Stampin' Up! has more fun for us this week! Get a BONUS FREE Download:If we get 18,000 downloads of FREE items we'll give you another FREE download! Wow!! Big 15% Off Stamp Sale Today Only! 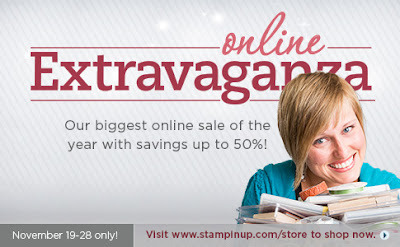 Don't miss out on Stampin' Up's! HUGE 15% off stamp sale TODAY ONLY! We've never had a sale like this before so check your wish list and head over to my online store and click on the Shop Now button. I'll also be putting in a large group order for my local ladies later today so if you'd rather e-mail me with your order please send it to mandysurovy@yahoo.com and I'll get it placed for you. Please e-mail if you have any questions! So is everyone running around getting ready for hurricane Sandy? We filled up the car gas tanks, got an extra propane tank for the grill and put away all the stuff that was out in the yard. We don't really expect much besides some wind and rain here in Glen Allen but we're prepared nonetheless! I hope you all will stay safe! I'll be spending some time in the stamp room I'm sure but for now I'll share one of the cards my ladies made this past week at my stamp-a-stack. The base is Naturals Ivory. Then we used another piece of Naturals Ivory which we heat embossed the medallion from Day of Gratitude on. The new Early Espresso embossing powder (in the Holiday catalog) is a wonderful color to use when black might just be, well, too black. 3 squares from the Orchard Harvest DSP are layered towards the bottom of the embossed panel and then a length of ribbon is knotted around it. In this photo I used 3/8" taffeta ribbon since I didn't have any of the Early Espresso stitched grosgrain when I made this sample. My ladies used the stitched grosgrain which I think goes better with the feel of this card. The sentiment was stamped in Early Espresso and then punched out with the Decorative Label punch. Another Decorative label was punched out of Island Indigo cardstock and then trimmed and layered behind. Finally the top panel was adhered to the base using dimensionals. It's a good day for a number of reasons one of which is that it's a new challenge at Fab Friday! Yay! How are you guys liking these awesome challenges from Mindy? I've been having a ton of fun and we'd love to see what you come up with for this challenge. So head over to Fab Friday to see all the inspiration from the other team members and then get to stamping! This is such a fun and versatile sketch that I actually had a hard time narrowing down what I wanted to do! That and the fact that my stamp room looked like a disaster area after having so many supplies pulled out to prepare for and host a stamp-a-stack for 18 people this week! Yikes! I had to really shovel off the desk before I got down to work. Once I had my idea (and found all the supplies) it came together pretty quickly. What do you think? I've hardly used any of the sheets from the Festival of Prints paper stack so I picked one and used it for my banner. Most of the patterns can be used for more than just Christmas cards too which is nice for all those scraps I know I'll have left! The base is Baja Breeze with snowflakes from the Snowflake Soiree set stamped in Baja Breeze in 2 corners and then "Merry" stamped over the snowflakes in Early Espresso ink. I rounded the 2 bottom corners with the corner rounder punch. The snowflakes were made with the Silver and Champagne glimmer paper and the Snow Flurry Bigz die. I layered the 2 snowflakes and adhered them together with a glue dot. To dress them up a bit I made a quick fork bow with 3/8" Whisper White taffeta ribbon and also adhered it with a glue dot. The snowflakes are attached to the card with a dimensional (of course!). This would be a great card to reproduce using different colors and patterns from the Festival of Prints paper stack. You could get so many different looks to the same design. Now that you've seen my card for the Fab Friday challenge it's your turn! Is everyone gearing up for the weekend? We just need to make it through Friday and we're golden right? I hope that you have some fun things planned. We have several things on our agenda so I'm sure the weekend will go quickly. My card today is one that I made several weeks ago for my mother-in-law when she asked if I could make her a stack of cards for some upcoming birthdays she needed to recognize. I used this Mojo Monday sketch from September. I didn't get it photographed in time to enter it but it was great to have a starting point. My mother-in-law needed about 10 cards and I only had a few in my stash that would fit so I had to come up with some new designs....I didn't want them all to look alike! No crazy techniques or anything on this card. Just some faux stitching around the edges. The image panel and the one behind it are cut with the Windows Framelits and I just offset the panels for some added interest. The scene was colored with inkpads and an Aquapainter. I used the Owl punch for the 2 small hearts and added 2 Vintage Trinket brads to the banners. I decided I had better get this project posted before Halloween has come and gone! I saw this adorable coffin (yes coffins can be adorable if they are made from paper!) on Splitcoaststampers so I followed the creators links and she has shared a quick tutorial on how to make these fun Halloween treats. Check out Selene Kempton's blog Stamp 4 Fun to see the how to. I shared this with my stamp club and they all thought it was adorable too. Little KitKat or Hershey bars fit perfectly! After we put together the coffins using the Petal cone die we dragged the edges across the Illuminate ink pad. Then we tied a bit of black 1/8" taffeta ribbon around it and knotted it on the side. The large scalloped circle is punched from Howlstooth & Scarringbone DSP. The Googly Ghouls were stamped in Stazon onto Very Vanilla and punched out with the wide oval punch. For the witch and Frankenstein we used a blender pen and Certainly Celery ink pad to color in their faces. And last are the googlie eyes which certainly add a lot of fun to these characters! What a great way to start off a Friday! A fun new challenge over at Fab Friday! And it was certainly a challenge for me! Mindy has a great set of colors for us this week and those of us on the design team even had a long lead time to work on upcoming challenges but for me this one was tough! I like the colors together, I like the colors on their own, even the Summer Starfruit is starting to grow on me. But every time I sat down to work on this challenge I just couldn't picture in my mind using any of my stamp sets with these colors....I know right....and I have A LOT of stamp sets to choose from! I finally got it done and I think it came out OK for a non-traditional colored Christmas card! Check out Midnight Muse, Island Indigo and Summer Starfruit! I kept this one pretty simple since the colors are so bold and the patterns on the ornaments are on the busy side. The white space in the back helps balance it all out. I just stamped the ornaments, cut them out with the coordinating framelits, popped them up on various layers of dimensionals on top of the embossed Holiday Frame, added the ribbon knots and rhinestones. The sentiments was stamped on Island Indigo with Midnight Muse ink and anchored to the largest ornament with a faceted button topped with a rhinestone. Here's a close up of the ornaments and how they are popped up. Just stack the dimensionals on top of each other to make each ornament higher than the last. The Island Indigo ornament uses 1 layer, then the Midnight Muse one has 2 layers and finally 3 layers for the Summer Starfruit. I hope you pop over the Fab Friday challenge to see the other design team creations and then join in on the fun! I can't wait to see what everyone creates with these colors! It's always so hard to pick our favorites!